These Baked Apples with Granola make a simple breakfast, mid-morning snack, or easy dessert. Sweet apples are filled with a brown sugar granola mixture and then baked until tender. Top them with a dollop of ice cream or whipped cream and you’ll be baking these over and over again! I think it’s safe to assume that I love apples. 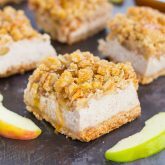 From my Slow Cooker Apple Butter, to these Caramel Apple Cheesecake Bars and those Caramel Apple Danish, this delectable fruit screams fall to me. Sure, I’ll eat apples any time of the year, but they seem to taste even better when the leaves start changing and the weather gets cooler. Agreed? Well, pull up a chair, pour some coffee, and keep on reading because you’re going to love my newest apple creation! Paula Dean, one of my favorite cooks, inspired this recipe. And it’s definitely on my top list of seasonal favorites! Baked Apples with Granola. Does it get any better than that? This dish does call for some sugar, but since apples and granola are involved, it can’t be that bad…right? The apples bake up soft and full of flavor. One bite and it’s almost like tasting a warm and cozy applesauce, with a sprinkling of granola! And because you spice up the granola with a mixture of cozy fall flavors, it makes a sweet and crunchy topping for the apples. And guys, this recipe is so easy! There is no peeling or slicing of apples with these babies! You simply slice an apple in half, scoop out the middle, fill with a granola mixture, and pop ’em in the oven. What could be easier than that? Baked Apples with Granola have quickly become my favorite fall snack. And since I always have an extra apple or two lying around my kitchen, it’s also a quick and healthy way to whip up a delicious treat. So if you’re looking for a new (and mouthwatering) way to use up those apples, give these Baked Apples with Granola a try! 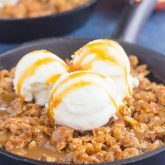 You’ll love the soft apple texture, combined with the sweet and hearty granola! Looking for more apple recipes? I’ve got you covered! These Baked Apples with Granola make a simple breakfast, mid-morning snack, or easy dessert. Sweet apples are filled with a brown sugar granola mixture and then baked until tender. Top them with a dollop of ice cream or whipped cream and you'll be baking these over and over again! Preheat oven to 350F. Lightly grease a 9x13 baking dish with non-stick cooking spray. Carefully scoop out apple filling, leaving about 1 /4 inch apple shell left in skin. Set apples in prepared dish. In a medium bowl, stir together granola, brown sugar, melted butter, vanilla extract, and cinnamon. Spoon mixture into apple halves. Remove foil and bake for another 15-20 minutes, or until apples are tender. Remove from oven and let cool slightly. Serve immediately. Inspired by Paula Deen's Fall Baking - 2014 magazine. Apples are best eaten the same day. 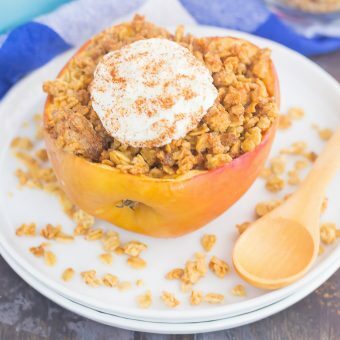 What a fun way to eat baked apples & granola together! I have some pumpkin granola from TJ that I need to use up before it goes stale. This would be perfect! Yum! 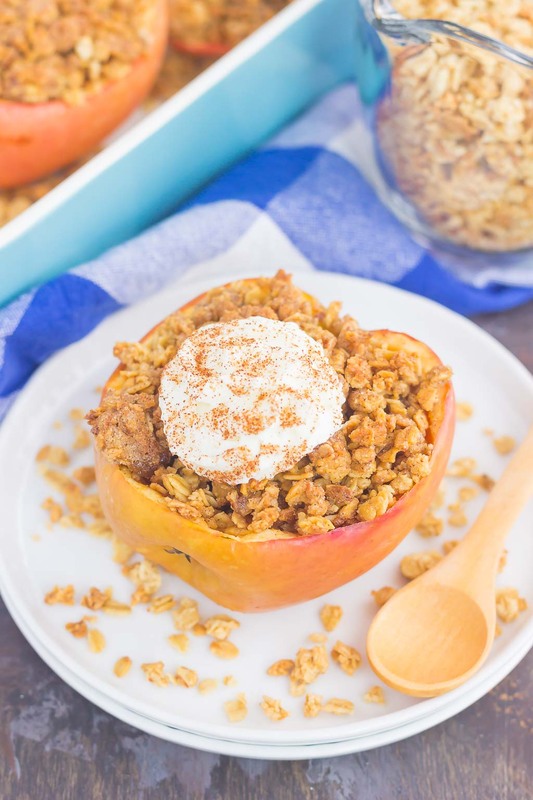 That pumpkin granola sounds like it would be the perfect fit for these baked apples, Jessie! This is a great idea! I've always thought that baked apples needed something to get them off the ground. This is it! And you could drizzle some caramel on there, too...mmm. ahhh I'm SO going to need to try these, they are like the perfect healthy desert...or breakfast, I mean it IS an apple and granola ;-) and I love the combo of crunchy granola and the soft baked apple! Gayle these look great ;-) pinning! have a beautiful weekend! Yes! You can't go wrong with apples and granola together...it's technically health food, right? Thanks so much for the pin and apple love, Michele! Have a great weekend, too! Hi Gayle! I love this idea for my mid-morning Fall snack, when I'm ravenously hungry and need something to keep me going. Delicious. So Fallish. And so easy, I have all these ingredients right on hand. Paula Deen's recipes are good =) Have a great weekend! This is such a great mid-morning snack, Laura! And so easy, too! Plus, it makes your house smell wonderful. Hope you have a great weekend too, Laura! I love this! It looks sooo easy, and it goes back to that theme of making fruit feel dessert-like! This is a great idea, Gayle! Thanks for sharing! I love a nice easy dessert! These look great, and I love that turquoise baking dish! Thanks, Kelly! I got the dish from Crate and Barrel! :) And I love easy dessert, too! This is so simple yet sounds delicious. I am for sure going to need baked apples with granola in my life. Pinning! Thanks for the apple love and pin, Jen! This is definitely a fruit combo that you need to try, it's amazing! Wow Gayle, what a simple and creative idea for a healthy fall snack ! I love it! Will try this soon, I like that you used honey crisp apples! Pinned to my apple board! Thanks for the kind words and pin, Mira! This is such an easy and delicious snack! And the texture of the baked apples is amazing! I'm sure you'll love this! I think you might just like apples as much as I do. Baking them is one of my favourite ways to eat them, apart from in a pie I think. I am an apple fanatic, Dannii! And baking them is so delicious! Love the aroma it gives off, too! I love baked apples this time of year! These look great! Thanks so much, Jessica! Fall is such a great time for all of the apple dishes to make an appearance! Who doesn't love everything fall? This looks great! I love baked apples, I usually stuff mine with sour cherries and ground walnuts, granola on top and some honey! That's a great idea to stuff the apples with cherries and walnuts, Catalina! I'll have to try that next time! Thanks, Karen! Apples and granola are my new favorite combination! Yum that looks amazing! I love apples and granola, combining them into a baked apple sounds like the best snack ever! I just made some pumpkin granola so I am definitely doing this this weekend! Pumpkin granola would be perfect with these apples, Stacey! And thanks for the granola love! Omg these apples are SUCH a genius idea, Gayle! This looks much easier than making an apple crisp, and I'll bet it tastes nearly the same! Thanks, Sarah! And yes, definitely sort of like apple crisp...I hadn't thought of that before! These baked apples look fantastic, Gayle! Love that you stuffed granola in them, that sounds like such a tasty idea :) Pinning! Thanks so much for the kind words and pin, Kelly! What a great idea to add the granola to baked apples, I always find that they are missing that crunch! Will have to give these a try before all the delicious apples are out of season. The granola definitely gives these apples a fun kick! Thanks for the kind words and for stopping by, Louisa! These look perfect for a lighter dessert! I agree that apples are so much better this time of year. I can't get enough of them! I love baking with apples year round, but they seem to taste even better in the fall! And these baked apples dessert make a perfect dessert or snack. Thanks, Danielle! Looks lovely! All it needs is little of French vanilla ice cream! Yum! Thanks, Valya! Ice cream would be perfect with these apples! Thanks, Ashley! Apples are so fun to bake with in the fall! Love simple snacks like this one, Gayle! Bet that granola adds the most amazing crunch to the apple. The granola makes these apples taste out of this world good! Thanks, Denise! I hope you love these baked apples if you try it, Nicole! They're delicious! And thanks so much for the kind words and for stopping by! I have pulled up a chair and I've got my coffee - Gayle, these look so, so wonderful! I would give anything for something so warming right now! <3 The granola is the best addition ever. Thanks so much for the kind words, Tash! The granola gives these apples an extra special touch! These apples look delish! Love the granola, so tasty! What a great idea! Aren't these just the cutest, funnest fall recipe?? My friend and I were recently looking at Quest bar recipes and one of them included baked apples like this!! SO clever and fun! :) LOVE it! Thanks, Cailee! It's a lighter, healthy treat that's perfect for a snack, breakfast, or dessert! These look really yummy!! Gotta try them soon! I hope you love it if you try it, Christina! Love baked apples, I bet they are perfect with the granola! Granola makes these apples insanely good, Cheri! God, I wish I could have this for breakfast right now! It looks delicious and healthy! That is my kind of breakfast!!! Looks delicious! What a great idea. Wow! I've never had baked apples like this. I'm in! beautiful pictures and such a brilliant recipe :D Pinning now! Thanks so much for the kind words and pin, Vanessa! I think you would love these baked apples! This looks amazing!! I love all things apple and granola related, especially in the fall. Thanks, Rachel! 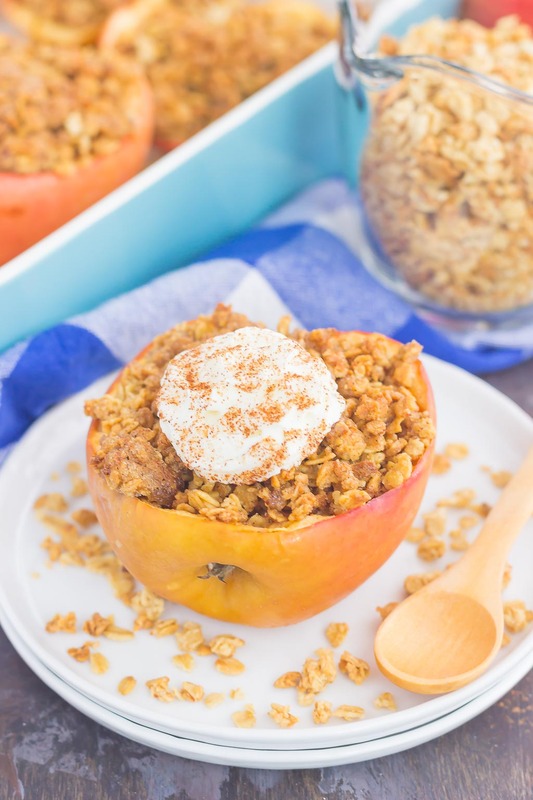 These baked apples and granola make the perfect combination! 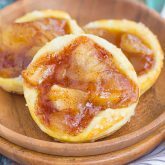 Wow, I've never had a baked apple before but these look wonderful! Yum! Thanks, Jessica! It's the perfect fall treat! 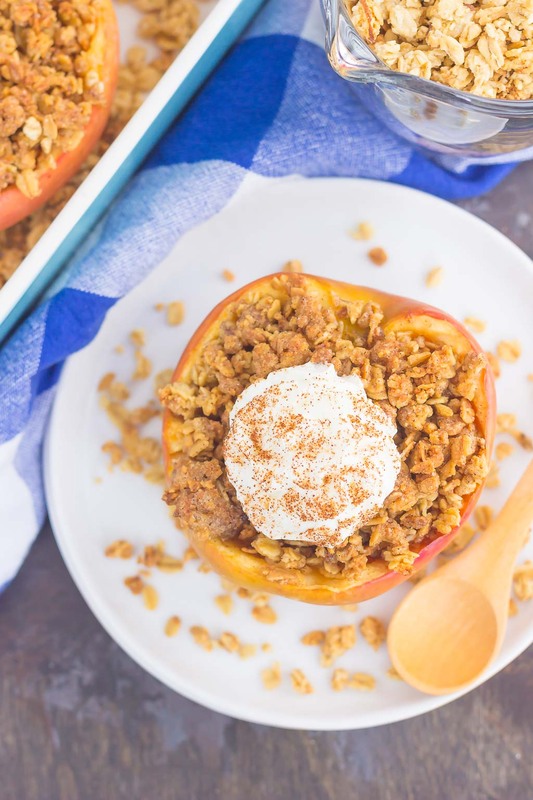 Baked apples and granola sound like a wonderful combination! I bet a dollop of greek yogurt on top would taste great! 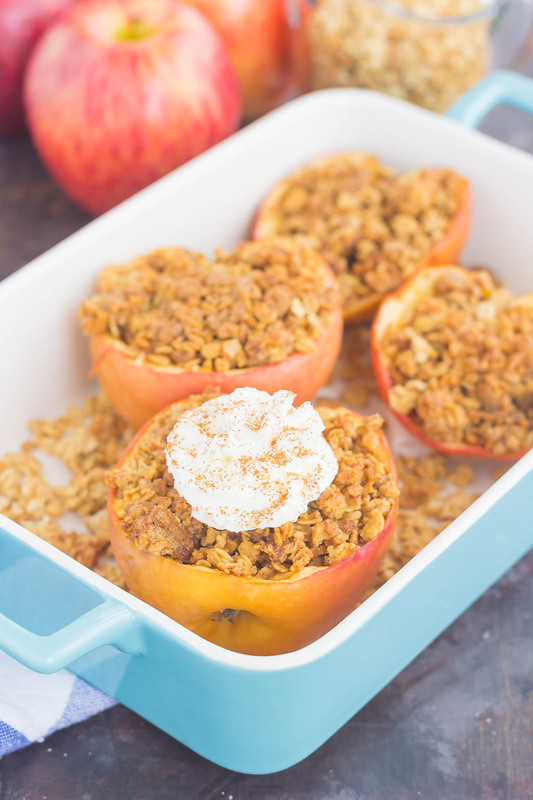 These baked apples with granola look delicious Gayle! 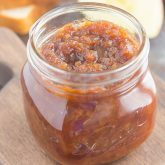 They make perfect use of seasonal produce right now and are perfect for a quick and easy dessert.. I could probably even justify having them for breakfast too (as they contain granola)! I agree, Samina! Apples just taste better in the fall. Thanks so much for the kind words! Mmmm! I always forget about baked apples. They are so easy and I always have apples in my fridge... I need to start making them ASAP!! These ones sound delicious! Thanks, Jess! This was actually my first time trying baked apples, and it definitely won't be the last! Ice cream would be the perfect touch! Thanks, Jocelyn!